This has been an activity that’s consumed my thoughts for awhile. Typically, the more something consumes my mind the more excited I am about it. I was on the search for a fun Easter Activity appropriate for Upper-Grades. It wasn’t until I stumbled across Pysanky: Ukrainian Easter Eggs, that I knew I had found it. The anticipation for the final reveal ignites engagement, the process requires higher order thinking, and the end product is completely beautiful. 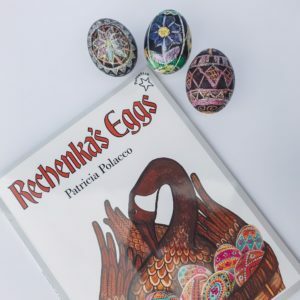 This process allows students to keep and treasure their pysanka for years to come. In my mind this project is for 10 year olds and up, however 3rd graders continue to surprise me! If you teach 3rd grade and have success with this project in your classroom please let me know! If you teach high-school, please consider introducing your students to the actual tools, and crafts of pysanka. I had to try it for myself and was immediately enveloped by my fascination for the craft. I told my husband that this was my new therapy, a better word would have been obsession. 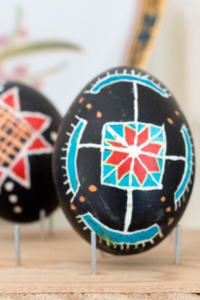 Pysanka has been around for thousands of years. Pysanka comes from the Ukranian word, “pysaty” which means, to write. Painting an egg and writing on an egg are two completely separate things. In Pysanky, a tool known as a kistka is used. Think of it as a stick with a small metal funnel at the end of it. The funnel is used to scoop up beeswax, then melt it over a flame. Once the temperature is right the wax drizzles through the funnel, allowing the user to draw with wax on the easter egg. Intricate designs can be created by alternating layers of wax and dye. Traditionally, only the colors white, yellow, red and black were used. Later, green dye was also introduced. Once the design is achieved the wax is melted off using the candle’s flame. As you remove the wax the different layers of colors once protected by the wax show through. I set out to come up with a classroom friendly, no flame necessary, pysanka copycat for kids. Like many I had experimented with crayons and egg dye in the past, but I had never considered melting the wax off the egg. This ended up taking a few trials and error to perfect, but I am so excited to say that I present this process to you with full confidence. Let’s get started! Before we can begin you need to order supplies for your students. Like craftivites in the past, I take into consideration the cost it takes to outfit your entire class with what they need. I know this is likely coming from your own pocket, which means I strive to bring the most cost-effective and engaging ideas to you! 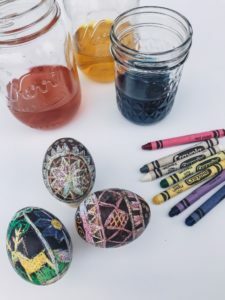 Egg Dye: Traditional Pysanka Egg Dye is beautiful and toxic. A simple food safe dye will give you a similar effect. If you are nervous about artificial dyes or have a student sensitive to specific food dyes, I’ve also included a more natural option below. I would highly recommend purchasing the black food dye as well, not only is it a traditional pysanky color, but the contrast is really stunning. To make the dye simply mix 1/2 cup of water with 1 TBSP of vinegar, and 20-25 drops of the desired color. Picture Book: Not necessary, but who doesn’t love Patricia Polacco. 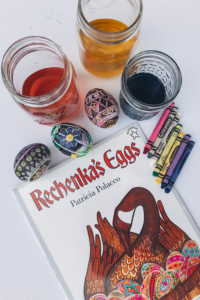 This is a really sweet book about a Babuska that paints and decorates award winning eggs. One day an unruly guest may stand in the way of her prize. A friendship blooms, and miracles are witnessed. This really is the perfect read aloud to tie in this activity. Students can also seek out inspiration from Polacco’s illustrations for their own designs! Egg Stands:If you plan to blow out the eggs, which is my recommendation. I also suggest glueing the eggs to a stand. This will prevent them from tipping over and allow them to be enjoyed for years to come. Don’t panic, I used my macgyvering skills to come up with an extremely affordable alternative. Technically, they are for peg dolls. Technically, they work swimmingly. Jumbo Push Pins If you don’t already have a pack of jumbo push pins in your classroom, I highly suggest purchasing a pack. They are the perfect size to allow you to get a better grip and handle on what you’re doing. I use these for the String Art Christmas Ornaments as well. However, I was able to have success poking a hole in the egg with both regular thumbtacks, and a regular push pin as well! Masking tape or Painter’s Tape: You will secure a piece on both the top and bottom of the egg when piercing it. The tape gives the pin a better grip as well as secures the egg to prevent it from cracking. White Vinegar: Allows the dye to better adhere to the egg’s shell. We’re talking CHEMICAL REACTION. Coarse Screws: You will use these to make the larger hole in the bottom of the egg if blowing them out. It took a little trial and error before my husband suggested a screw. He’s a gem, and these worked like a gem. Honest to goodness fool proof way for emptying an egg. Syringe Pack: When blowing out an egg you’re supposed to use your mouth…No thanks. THESE WORKED BEAUTIFULLY. Honestly, better than I imagined they would. (Recommended for Upper Grades) Regular Crayons 2 Pack 64 Count: Regular crayons are going to be your best bet to get the best coverage, better wax resistant and most contrast with your colors. Interestingly enough not all the crayons are created equally when it comes to this project. I found that your reds, purples, and blues perform the best. See my visual in the process below. Keep in mind these crayons require more heat in order to be wiped away. This can easily and safely be done with a blow dryer. From my little science experiment if you plan to let the eggs soak or want better coverage regular crayons are your best bet. Red, blues, purples seemed to perform the best. 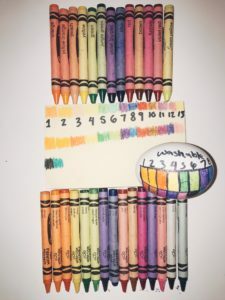 (Recommended for younger grades)Washable Crayola Crayons: I know it seems so wrong to purchase crayons when you are surrounded by broken remnants everywhere in your classroom. These worked really well because of their “lavability”, melting point. These released and wiped clean easier than the regular crayons did. However, some colors worked better that others. I’d avoid purple, it went on very smooth but didn’t adhere to the egg like I wanted it to. You also want your egg dry before adding more designs with your crayon. These crayons will work better for younger grades because the wax doesn’t need to reach as high as temperature to be removed. The only caveat is that these crayons are designed to be washable with warm water. Which means if you plan to soak your eggs for a long period of time, you risk the crayon simply washing off. The bonus is that if you are nervous about using heat or a blow dryer to remove the wax you could technically just wash it off with warm water to get a similar effect. Class Set Crayon Sharpeners: Not necessary but a good idea for students wanting to achieve a more fine and delicate design. If you’re like me, then you are itching to get your hands on an actual Kistka and try your hand at some genuine Pysanky. Below is the kit I purchased and it was perfect! I am legitimately planning a Pyskany Party for friends and family to try their hand at this ancient craft! 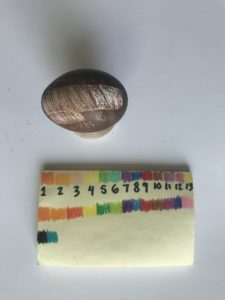 Pysanky Terminology and History: Reading Comprehension Questions, and Crossword Puzzles. Pysanka Symbols, Colors, and their meaning. Design your own Pysanka: Methodical planning, design, process, color mixing. 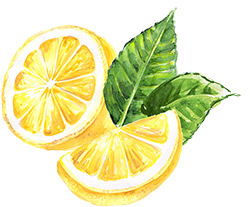 Everything's better with a little lemon!